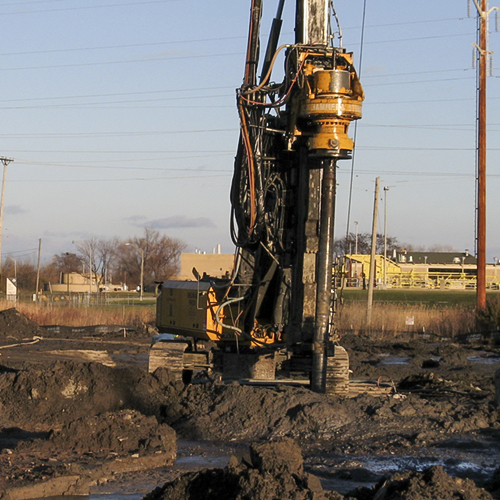 In-Situ Soil Mixing, first used in the U.S. in the 1950s, was developed in Europe and Japan in the 1960s, 1970s, and 1980s, after which it was reintroduced into the U.S in the late 1980’s by the principals of Geo-Solutions. 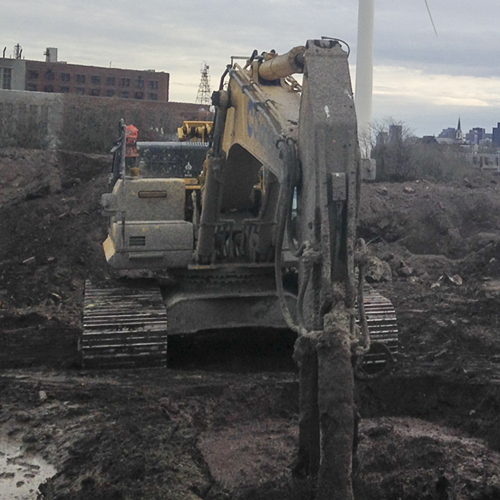 Since the re-introduction of soil mixing into the U.S. market, soil mixing applications have grown rapidly, particularly in the environmental remediation market. Soil mixing is also commonly referred to as auger mixing, In-Situ Stabilization/Solidification, stabilization / solidification (S/S), stabilization, solidification, deep mixing method, soil cement columns / piles, SMW, cement soil mixing, and rotary mixing. Three specific types of In-Situ Soil Mixing include Deep Soil Mixing (DSM), Shallow Soil Mixing (SSM), and Backhoe Stabilization. 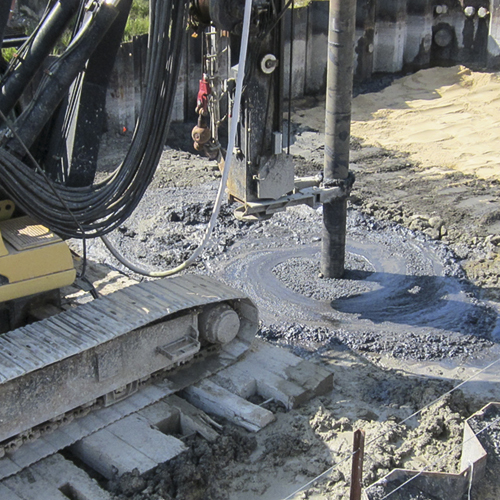 Typically for environmental remediation applications, soil mixing is performed using a large diameter (typically 3 to 12 ft diameter) auger with mixing paddles and grout ports. Generally, as the soil mixing auger penetrates the soil, a fluid grout is added to and mixed with the soil. 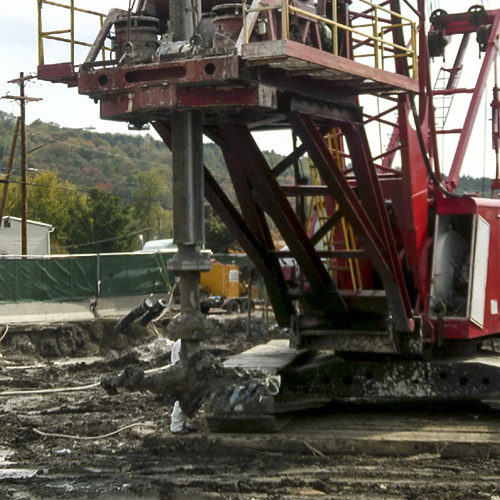 The fluid acts as an aid to drilling and is mixed into the drilled soil column, creating a soil-cement (among other additives) mass. Although Portland cement is the most common reagent, other reagents such as blast furnace slag, flyash, cement kiln dust, and bentonite are widely used alone or in conjunction with cement. Despite the wide range of applications and construction methods, the goal of soil mixing is universal; the creation of a soil-reagent composite with improved properties relative to the in-situ soils. The most common improvement goals are increased strength (generally unconfined compressive strength) and decreased permeability. Increased seismic shear resistance and leachability reduction are less common project goals. 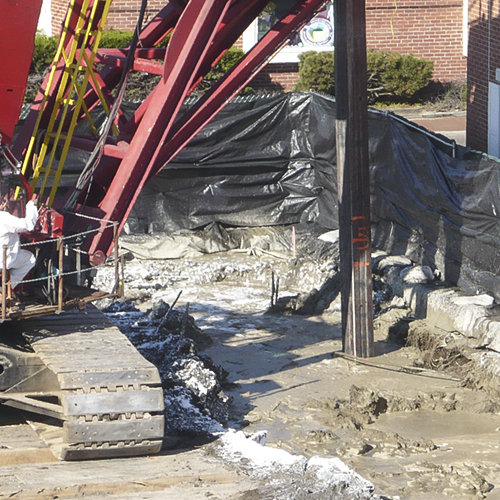 In-Situ Soil Mixing is used to create structural elements for foundations and retaining walls, soil improvement, and in-situ treatment / stabilization / solidification of subsurface contaminants. 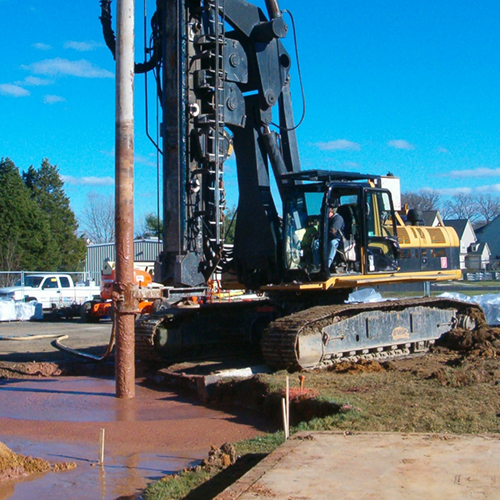 It is also used with specialized cementing and chemical reagents for hazardous waste treatment, environmental site remediations, sludge stabilization / solidification, lagoon stabilization, chemical oxidation, and for constructing underground vertical barriers (both permeable and impermeable) for groundwater containment and treatment. 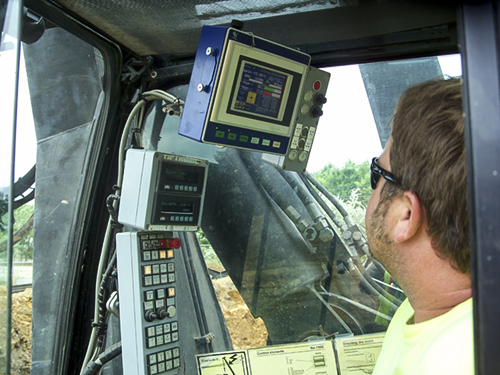 Soil mixing applications have grown significantly over the last two decades as Owners and Engineers have learned of the cost saving and technical benefits of soil mixing over alternative technologies. 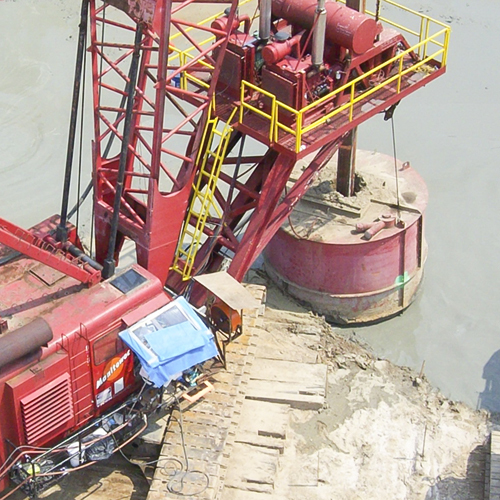 Geo-Solutions provides a range of services for In-Situ Soil Mixing from treatability studies to design support and construction. 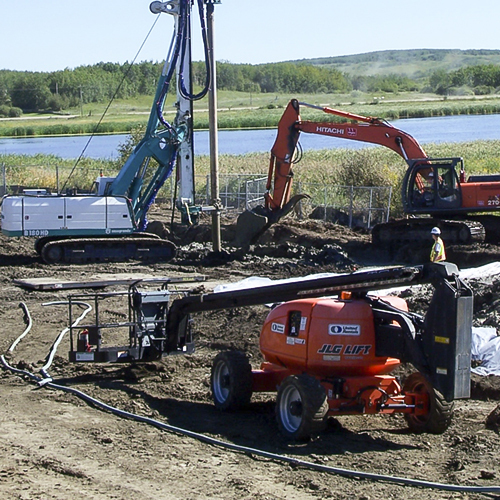 For some projects, our highly specialized crews can provide all of the construction services needed for In-Situ Soil Mixing. 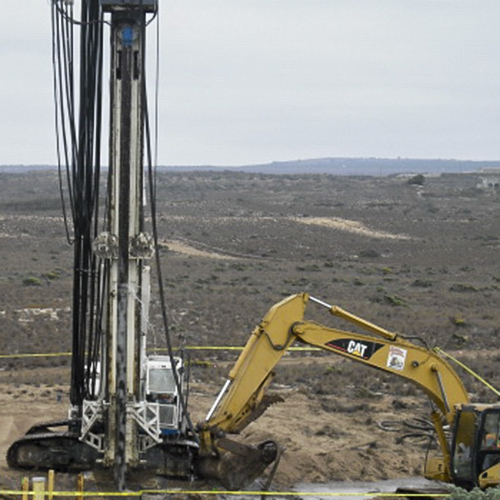 For other soil mixing projects, we can provide our technical assistance services including supervision, grout plants, and key elements of the specialized drilling and mixing equipment that provide the best combination of technical expertise and economy. 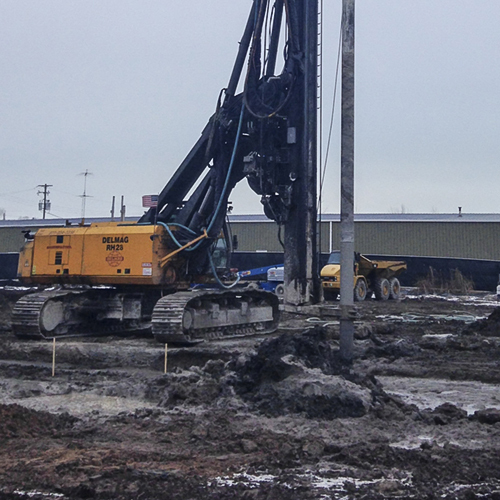 With our extensive In-Situ Soil Mixing experience and specialty equipment we can often help General Contractors or Owners do the work themselves. The in-situ treatment of contaminated soils and groundwater with reactive media is a new and growing application for In-Situ Soil Mixing. Reagents such as zero valent iron, specialty clays (organophyllic, attapulgite, bentonite), carbon, oxidants, and reactive media can be economically introduced and mixed to treat chemical hot spots using Deep Soil Mixing and Shallow Soil Mixing. 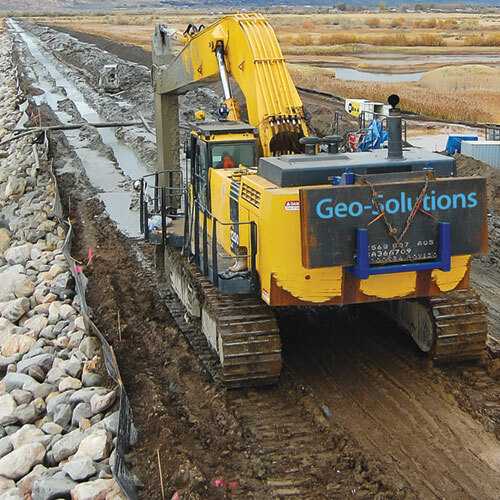 Geo-Solutions has been at the forefront of this type of application. 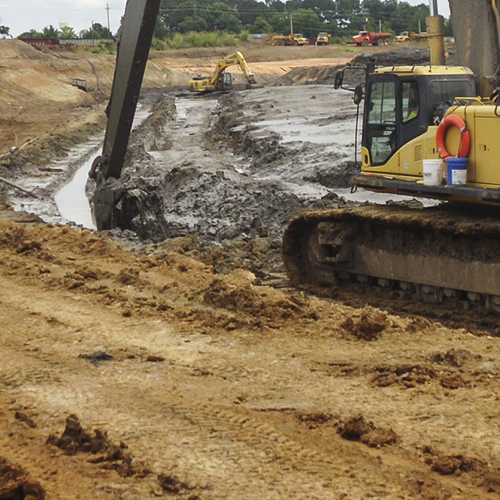 We help formulate workable and practical soil / grout mixtures that can be used for sludge stabilization and the successful treatment of other toxic contaminants. 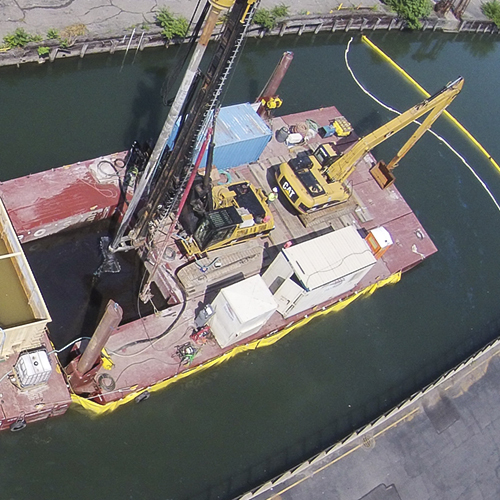 The management of Geo-Solutions was a key factor in the growth of this technology in the U.S. market for such applications as sludge stabilization and hazardous waste treatment. Chris Ryan, former President of Geo-Solutions, conceived and sold the first major application at the Jackson Lake Dam project in Wyoming. 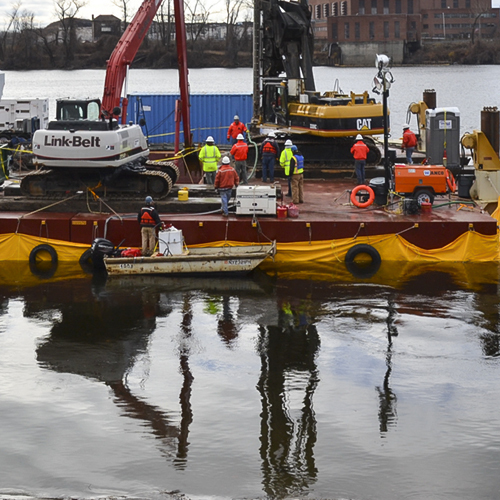 He also oversaw the construction of the first U.S. manufactured Deep Soil Mixing (DSM) rig and the first application of large diameter single shaft Shallow Soil Mixing (SSM) for the purpose of hazardous waste remediation. 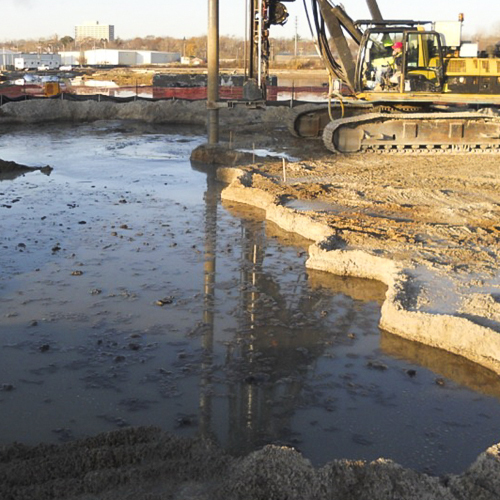 Bob Schindler, President of Geo-Solutions, and Steve Day, Technical Director, have been involved in the growth of application of various treatment technologies for sludge stabilization and waste remediation using In-Situ Soil Mixing. We have also been leaders in the In-Situ Treatment / Stabilization / Solidification of Manufactured Gas Plant (MGP) wastes using a variation of In-Situ Soil Mixing methods, but most commonly using ISS (in-situ stabilization / solidification).